With AMD latest Catalyst 15.7 driver you can CrossFire between the R9 300 series and the older R9 200 series GPUs, it’s now possible to pair a Radeon R9 300 series graphics card with one based on a similar-spec chip from the R9 200 series. At launch, the R9 300 series and R9 Fury series had a separate driver branch from the remaining lineup, which was unified with Catalyst 15.7 WHQL. Now, you may pair an R9 390 or R9 390X, with an R9 290 or R9 290X. You may even create a 4-way CrossFire setup with one each of the four cards. 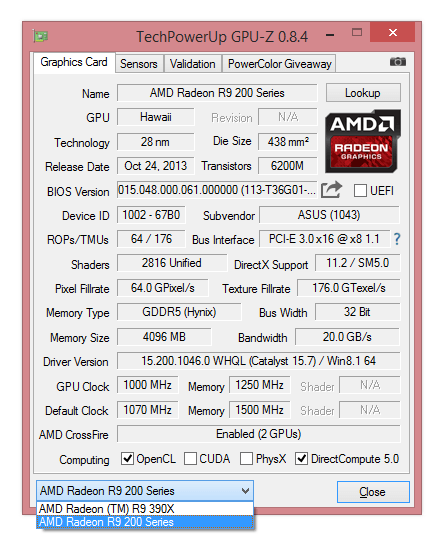 You should even be able to combine R9 380 with R9 285. AMD allowed similar cross-generation pairings in the past, such as those between the R9 280 series and HD 7900 series, and between the R9 270 series and HD 7800 series. The company’s newer GPUs feature XDMA CrossFire, which does away with bridge cables, for increased flexibility.